Take a break from browsing art on view and enjoy lunch or coffee and dessert while looking out on the beautifully landscaped gardens surrounding the museum. Take a break from browsing art on view and enjoy lunch or coffee and dessert while looking out on the beautifully landscaped gardens surrounding the museum. 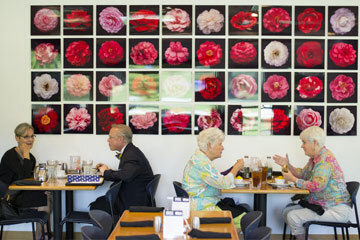 The Camellia Court Café is located on the lower level of the contemporary gallery in the Mary Ann Harn Cofrin Pavilion. For more information, call 352.392.2733. The café’s menu change seasonally and include a selection of soups, salads, sandwiches, tapas and desserts. 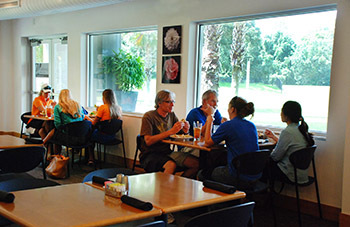 The Café accepts University of Florida meal plans for UF faculty, staff, and students. Tuesday – Saturday, 11 a.m. – 2 p.m.
Reservations are accepted, during café hours at 352.392.2733. Reservations are encouraged for groups up to 15 guests. Unfortunately, the café cannot reserve seating for groups larger than 15 guests. Please see below information about group meal planning. We encourage all groups, up to 15 guests, to contact the Café in advance at 352.392.2733. Please consider pre-ordering from our group menu or boxed lunch options. In order to better serve groups visiting the museum and expedite service, parties of 16 or more can reserve a private rental space for their visit, depending on availability, by calling the Harn Museum Rental Department at 352.294.7079 or filling out a rental request form located on the rentals area of our website. For more information on how you can rent the café space during closed or evening hours, visit the Facility Rentals area of our website. 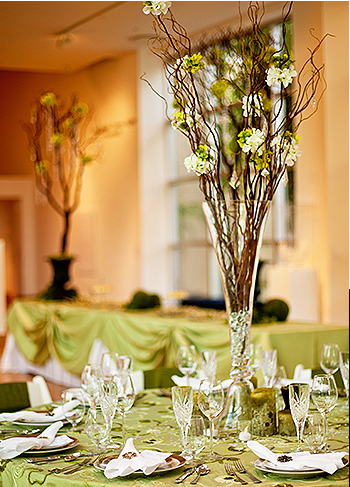 Whether casual or formal, hold your next business or social event at the Harn. Our multi-purpose spaces can be adapted to meet your needs for lectures, conferences, meetings, parties, receptions, luncheons and more.